Within the last three years, I have given myself a real push to spend more time in my kitchen preparing meals of my own. It is so rewarding to put the time in to create a dish that guests (and yourself) just love. But one culinary feat that I have decided to pursue in 2013 is baking! Don’t get me wrong, I can make a mean cupcake out of a box, but I really want to learn the craft and skill of baking from scratch. I decided that I would try a very timeless and delicious first cake for my next Pretty Little Pastime, Texas Sheet Cake. To make the cake, melt the butter in a large saucepan over medium heat. Whisk in the cocoa. Add oil and water and bring to a rolling boil for 30 seconds. Remove the pan from the heat and set aside. In a large mixing bowl, sift together the flour, sugar, baking soda, and salt. Whisk by hand until they are well mixed. Pour the warm cocoa mixture into the sifted ingredients and whisk until just combined. In a small mixing bowl, whisk together the eggs, buttermilk, and vanilla extract. With a rubber spatula, stir the buttermilk mixture into the batter. Pour the batter into a greased 15 x 10 x 2 inch baking pan (I lined mine with parchment paper instead of greasing). Place on the center rack and bake for 32-35 minutes or until the top is firm and a toothpick inserted in the middle comes out with moist crumbs (mine was ready at 27 minutes, so check a few minutes early). While the cake is baking, make the frosting. Melt the butter in a saucepan over medium heat. Whisk in the cocoa and bring the mixture to a rolling boil for 30 seconds. Remove from heat and whisk in the milk and vanilla. Add the sifted confectioner’s sugar 1 cup at a time while whisking continuously. Immediately after the cake comes out of the oven, pour the frosting over the hot cake and sprinkle with walnuts. Try not to move the cake before it sets to avoid ripples in the frosting. Allow to cook before cutting. This cake was so easy to make and came out delicious! 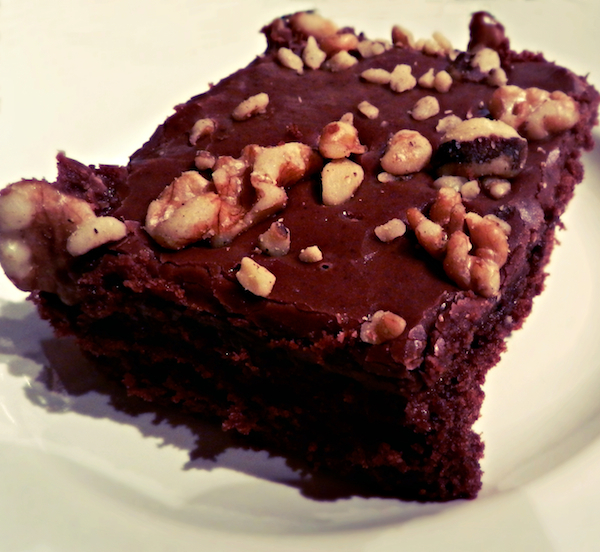 It was chocolatey and thin like a brownie, but moist and fluffy like a cake; the perfect combination. Keep it mind that this recipe makes a large cake, so it is perfect for entertaining. I was also surprised at how well it kept. When well wrapped and stored at room temperature, your cake will keep up to 5 days! After two days, I took what was left to the office and it was a huge hit. No one would have guessed that I made it ahead of time. I will definitely be adding this Texas Sheet Cake to my go-to cake recipes! recipe source: Vintage Cakes by Julie Richardson.